Extremist group has sent money, trainers and fighters to expand its reach. Islamic State leaders in Syria have sent money, trainers and fighters to Libya in increasing numbers, raising new concerns for the U.S. that the militant group is gaining traction in its attempts to broaden its reach and expand its influence. 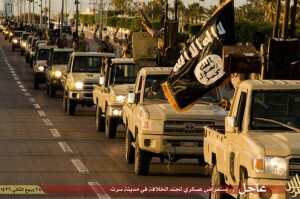 In recent months, U.S. military officials said, Islamic State has solidified its foothold in Libya as it searches for ways to capitalize on rising popularity among extremist groups around the world. Islamic State’s growth as a powerful anti-Western force has militant groups throughout the world trying to latch onto its notoriety. But until recently, affiliates have operated with a great degree of independence and there was little evidence they were taking orders from the group’s core leadership in Syria and Iraq, American officials said. The core group benefited by pointing to the mushrooming number of affiliates to show its self-styled caliphate was expanding. But the gains in North Africa mark the first expansion of the group’s reach outside the Middle East beyond rebranding efforts by militants trying to secure direct support from the Syrian-based extremists, U.S. officials said. Islamic State’s foothold in Libya also gives the group a new staging base to plan attacks in North Africa and across the Mediterranean Sea in Europe.